The latest edition of the Authorised Daily Prayer Book (“Singer’s Siddur”) with translation and commentary by Rabbi Sacks – from which the translation in the Koren-Sacks Siddur is taken – was published in 2006. The penultimate edition the Authorised Daily Prayer Book from 1992 was edited by Rabbi Sacks and translated by Rabbi Eli Cashdan. 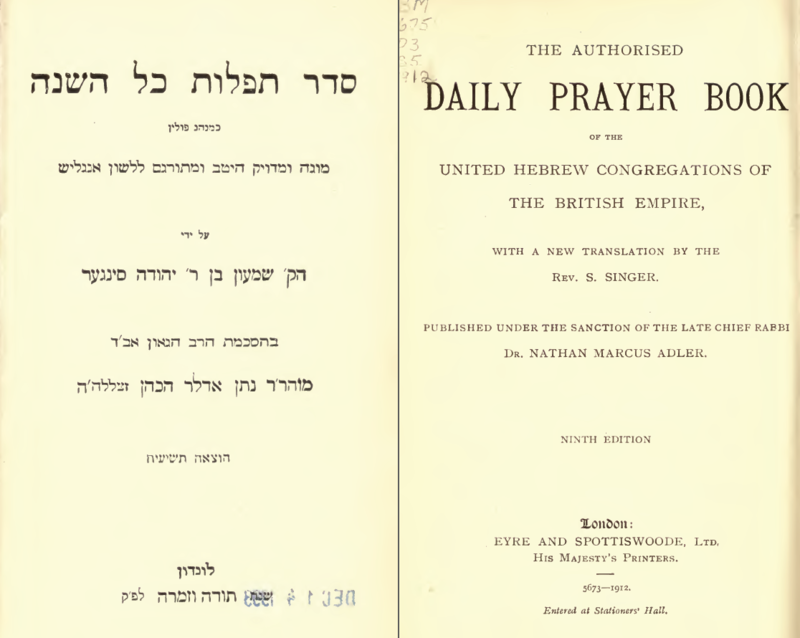 Before the Koren-Sacks Siddur (2009), there was the Authorised Daily Prayer Book first published in 1890 and used by Jews throughout the British Empire, while there was a British Empire. The siddur was originally published under the authorization of Great Britain’s Chief Rabbi, Rabbi Nathan Marcus Adler with a Hebrew liturgy based on Isaac Seligman Baer’s Seder Avodat Yisroel (1868). The translation by Rabbi Simeon Singer (1846-1906) was the most extensive English translation of the Siddur as yet published, and for this reason most editions are simply referred colloquially as The Singer Siddur. The Standard Prayer Book, published by Bloch in 1915, was an American reprint of The Authorized Daily Prayer Book. 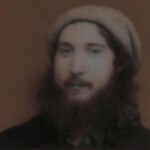 Before his death in April 2010, John Hare, z”l, of the Internet Sacred Text Archive, asked us what he could do for us in return for our help on the 1917 JPS. He had just acquired a copy of the Standard Prayer Book and wondered whether we needed that. He completed the work in January 2010, one of the last projects he completed. The full text of Rabbi Singer’s English translation in the Singer Siddur is available at the Internet Sacred Text Archive. (The prepared transcription may also be downloaded from here as JLPTEI formatted TXT or HTML file.) A PDF of the Singer Siddur without Hare’s transcription is available from Archive.org. Hare’s transcription of the 1915 Bloch edition of Singer’s Siddur does not include Rabbi Singer’s extensive notes. We are actively transcribing these notes which were arranged by Israel Abrahams and published posthumously in a 1914 edition of the Authorised Daily Prayer Book. Please help us transcribe and proofread these notes at Wikisource. Given our work transcribing Seder Avodat Yisroel, having Singer’s translation offers an opportunity to link both Public Domain texts together in our open source public database. Recently, we moved closer to this goal by fully encoding Singer’s translation in our open standard XML format and uploading it into our database. Many thanks to Ze’ev Clementson and Efraim Feinstein for working on this. “סדר תפלות כל השנה | The Authorised Daily Prayer Book of the United Hebrew Congregations of the British Empire (trans. Rabbi Simeon Singer, 1890)” is shared by Aharon N. Varady (transcription) with a Creative Commons Public Domain Dedication 1.0 Universal license. Please reciprocate for any adaptation or redistribution of this work by (1) properly attributing the work to Aharon N. Varady (transcription) and Simeon Singer, (2) clearly indicating the date you accessed the resource and whether any changes have been made (and if so, please be in touch with us and leave a comment below so that we might note your adaptation or improvement), (3) providing a link back to this source, and (4) specifying the Creative Commons Zero (CC 0) Universal license a Public Domain dedication under which this work was shared. 2013-01-11 – 29 Tevet 5773 at 2:49 am · Reply. I am looking for the shortened form of grace as it appears in the Singer siddur. I have not seen it printed anywhere else. I am looking for a PDF version of the full Hebrew text. I have searched your site and not even found a scan, even though it appears that you have attempted to create a link. 2013-01-11 – 29 Tevet 5773 at 7:07 am · Reply. The short form of the Birkat Hamazon can be found on page 286 of Rabbi Simeon Singer’s Authorised Daily Prayer Prayer Book. The entire siddur is being transcribed on wikisource. (Please help us proofread the transcription of Israel Abraham’s introduction). For the images of the specific pages, see here for the English and Hebrew. 2013-05-09 – 1 Sivan 5773 at 4:59 am · Reply. 1. It is Chief Rabbi Jonathan Sacks with a “ck”, not “ch”. 2. The Koren Sacks siddur was first published in 2009, not 2006. 3. The latest edition of the “Authorised Daily Prayer Book” (“Singer’s Siddur”) with translation and commentary by Rabbi Sacks – from which the translation in the Koren Sacks Siddur is taken – was published in 2006. The earlier edition of the Singer’s Siddur in the 1990s was EDITED by Rabbi Sacks, but translated by Rabbi Eli Cashdan. 2013-05-09 – 1 Sivan 5773 at 8:05 am · Reply. Thank you, Ben, for your corrections. 2016-09-13 – 10 Elul 5776 at 12:59 pm · Reply.